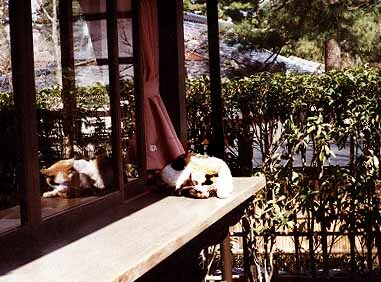 A "lucky" three-colored cat, asleep on the ticket booth counter at Tenryuji, Kyoto. Cat, sleeping, zen, white, brown, black, ticket booth, window, sunshine. Buying tickets, animals, colors, positionals, sightseeing, weather, nature. Descriptions, locations, counter for animals, tickets, daily activity verbs, ~te iru.